IF YOU’RE LOOKING FOR QUALITY EVENTS – REGISTER FREE TODAY ON OUR NATIONAL DATABASE. Streetzine has teamed up with some of the UK’s leading event organisers, wedding planners and corporate entertainment companies to bring you more work opportunities throughout the UK. It’s simple and FREE to register your catering business with us, there are no hidden charges and you do not need to be a member of any affiliation. 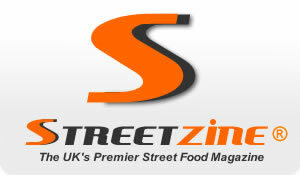 Each trader will receive a FREE comprehensive listing (Example: www.streetfoodnews.co.uk/brazillian-street-food) and when we receive news of an event we will feature this on our website, fortnightly e-newsletter and twitter feed, so make sure you check back regularly to keep updated. We don’t charge an annual membership fee and its FREE to register, we respect that you came into this business to be independent and we truly want to help to keep you this way! If you need to know what cert’s and licences you need, we can advise you where and how to get these, but we are sure that if you have come into this business you know what credentials you must have to be above board and legal, we can’t accept any responsibility and accept no liability, so please ensure you have all the boxes ticked from your local council and be confident that if you get spot checked at an event, your efforts and expenditure won’t be wasted on not being able to trade! We have a number of trusted suppliers who offer discounts to our members, if you ever need any advice on any aspect of trading, we have over 30 years of knowledge to share with you in the mobile catering industry and have experienced the best and worst scenarios. We’re not into testimonials but if you want us to brag about how fab we are, we won’t and what have you got to lose after all as it’s totally Free! – Full contact details – Name, Address, Tel No:, Web Address, Twitter Address, Facebook etc etc..
– Pictures of your stall, gazebo, trailer, vehicle, cart, trolley, hut etc…. – Please supply your insurance details, including policy number and expiration date. – Finally, anything else you can think of that will make you shine to prospective event organisers and make them want you at their next event! Once we have received your details, we will email you with confirmation and set up a trader profile page for you… Job Done!